You might remember heroic figures like Oskar Schindler (the famous “Schindler’s List”) who, during World War 2, rescued groups of Jews from certain annihilation. 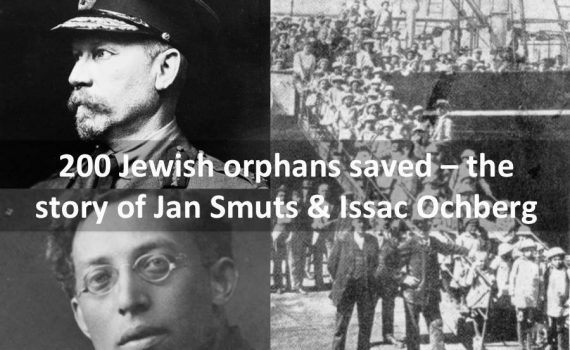 But did you know Jan Smuts also played a significant role in rescuing 200 Jewish orphans from the Ukraine in 1921? Here’s a little bit of unknown history involving an unlikely South African hero, Isaac Ochberg, and it’s one we can all stand proud of. Two questions became critical: How could the orphans be rescued from a war-torn region, and would the South African government create any difficulties in admitting them? Ochberg quickly met Jan Smuts, prime minister between 1919–1924, who gave the children entry visas. Smuts could have sunk the rescue plan in an instant, had he chosen to. His support was essential and warmly welcomed. was coming and he was going to take some of them away to a new home, on the other side of the world. Content and article sourced from The Jerusalem Post from an article by Lionel Slier 07/18/201. Researched and posted for the South African Legion by Peter Dickens.